If you've been keeping up with environmental issues, you know that vampire power is the power that your electronic gadgets use when they're turned off but still plugged in. 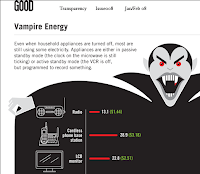 Good Magazine did a great graphic comparing amounts of vampire power used by common gizmos. Easiest solution to stop losing power to the vampire effect: plug your electronics into a surge protector and turn off the surge protector when the gadgets aren't in use. Or you could get a fancy surge protector that does it by itself.